Certain Far Eastern (FE) keyboard layouts have special functions, which don't fit the common model of a key's function being fully defined by its virtual key code, and the high-level Unicode mappings assigned to its modifier positions. This functionality is hereby referred to as the Special NLS functions, with NLS standing for National Language Support. Any special NLS functions found in the original layout are now preserved in the custom layouts saved by KbdEdit. This allows the user to customise system FE layouts such as Japanese and Korean without losing the special FE functions present in the original layouts. The low-level editor UI shows details of any special NLS functions present in the current layout. 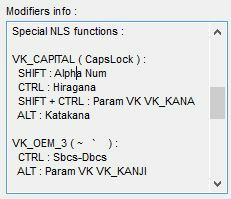 Special NLS functions, where defined, override the key's normal functionality for select combinations of the Shift, Ctrl and Alt modifier keys. Of special note is the so-called "param VK" function - it causes the original key to "mutate" into a different VK code for the chosen modifier combination, without having to actually set aside a dedicated physical key for the "mutated" VK code. Thanks to this function, the Japanese keyboard can toggle the KANA state for KANALOK mappings using Shift+Ctrl+CapsLock, which has the same effect as if VK_KANA was mapped to a hypothetical physical key of its own. Likewise, Alt+VK_OEM_3 produces the VK_KANJI code, removing the need for a dedicated Kanji key. The Shift / Ctrl / Alt combinations controlling the special NLS functions are not restricted to the active modifier combinations available for high-level Unicode mappings. This is why NLS functions such as Alt+VK_CAPITAL (Katakana) and Alt+VK_OEM_3 (VK_KANJI) are possible, even though Alt alone is not a valid high-level modifier combination. Although editing of special NLS function is currently not supported, KbdEdit UI shows details of any such functions that may exist in the current layout. Japanese JP Japanese Keyboard Layout Stub driver 00000411 "Japanese"
Korean KO Hangeul Keyboard Layout Stub driver 00000412 "Korean"
Korean KO Hangeul Keyboard Layout for 101 (Type A) Not registered by default. Japanese JP Japanese Keyboard Layout for (NEC PC-9800) Not registered. By default, only first two of the above files are registered in the Windows list of installed layouts, making them directly accessible in the Windows keyboard selection UI. To open any of these files in KbdEdit, you first have to import them via KbdEdit's Registered Layout DLL file command (note that this doesn't work for the last five layouts in the list, as they are currently not supported by KbdEdit).